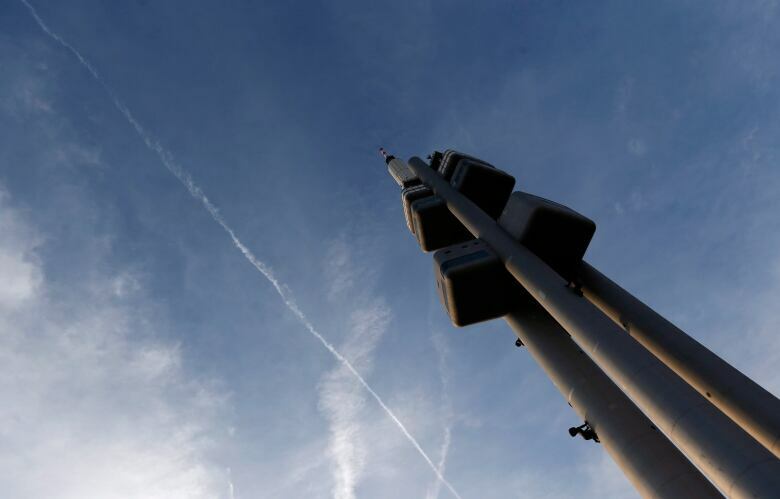 Residents of Prague recently said goodbye to the giant babies sculptures that were attached to the city's notoriously ugly TV tower. 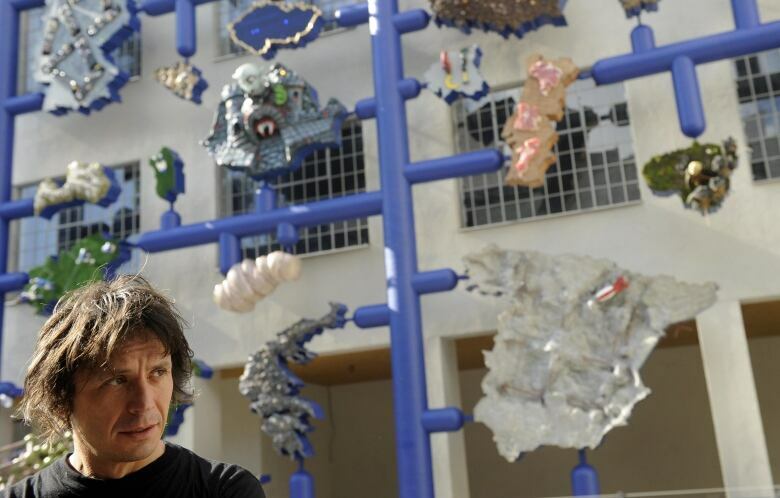 But artist David Czerny promises his sculptures will soon be toddling back into place. There's something missing from the Prague skyline. Towering above the city is a Soviet-era television tower. It's a brutalist classic that's been named the second ugliest building in the world. But for the past two decades, Žižkov Tower's ugliness has been tempered by a group of ten giant crawling babies. To be clear, the babies aren't real. They're massive sculptures — the work of Czech artist David Cerny. Cerny spoke with As It Happens host Carol Off about why it was time to take the babies down for repairs. David, these babies are coming down from the TV towers for repairs. What kind of shape are they in? After 18 years, in rather difficult weather conditions, the paint is basically peeled off. We need to repaint them. We have to check the inside frame, the metal construction, which actually is attached to the tower, and a couple other maintenance. So, there probably will be a change in the way they are actually anchored to the tower. This tower is called the second-ugliest building in the world. What made the babies so popular when you had them installed? 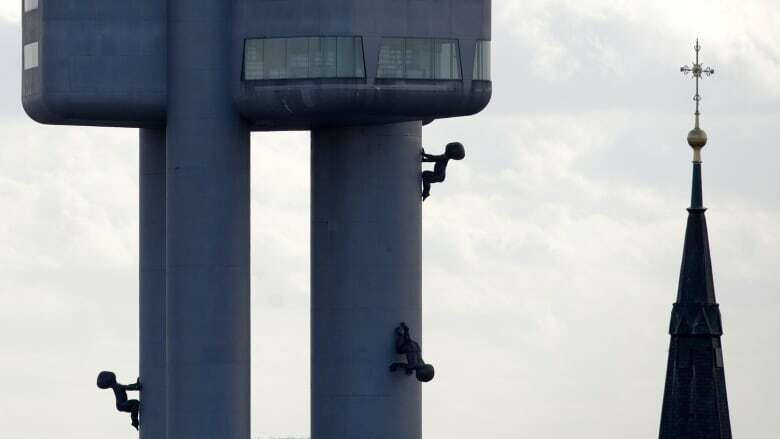 Why are people so attached to those babies crawling up the tower? It might be because it is the ugliest building in the world and the babies make it better — or the babies actually make the tower the ugliest thing in the world. You never know. I have no clue, to be honest. They're very amusing. It's also this building. Žižkov Tower has quite a history. People hate it for many reasons — some of them political. Can you tell us how people feel about this tower and why? The Bolsheviks, in the '80s, started working on this project because they needed to have a high tower in the middle of the city to actually be able to spy on people and to disrupt the broadcasting from radio. But the project was going on during near the end of communism and the way the Communists actually picked the place where to build it was very unhappy. They picked the middle of the city where there was a Jewish cemetery. They completely ruined all of the Jewish cemetery. During this time they were digging out skeletons. So, that's one of the reasons. Also, in that time, it is really like sticking out from the historical part of the city. So it was quite hated also because of that. But since then, people sort of get used to it. Of course, I know the architect, and I think that he was pretty pleased that I actually came up with the idea to attach the babies on it because it somehow makes it more acceptable. After the babies are repaired they are going to be back crawling up the tower again, right? They'll be attached back in the spring, completely repainted and completely restructured. There is even a way that we might remake all of them completely. So I would have 10 spare babies to send to the United States. I have to ask about one of your works we talked about last time we spoke. You floated, on a barge, a giant purple middle finger that was pointing at Prague Castle, which is the seat of the president. Is the middle finger still pointing to the president's office? Unfortunately not. But I think he deserves it all the time since he actually joined the office. Now we are going to have presidential elections after five years and I was thinking how can I overtake that? And it's difficult because I would have to make that finger something like five times bigger. This would be the only answer to what he did within those five years because he put this country into something like what [U.S. President Donald] Trump is doing now. This transcript has been edited for length and clarity. For more on this story, listen to our full interview with David Cerny.